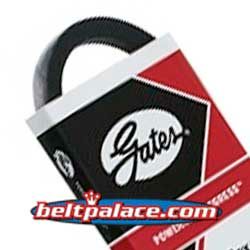 GATES 6843 Powerated V-Belt, 4L430K. Home > Light Duty V Belts > Gates Powerated V Belts. 3/8" thru 5/8" Widths. > 6843 PoweRated V-Belt, 4L430K. 6843 PoweRated V-Belt. 4L Section. 1/2" W x 43" Length. 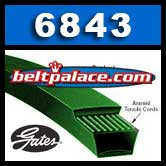 GATES 6843 Belt meets ARPM / RMA IP-3-2 oil and heat resistant standards. Ideal for Snow blowers/throwers, lawn & garden equipment, and other heavy clutching applications. A41 Industrial V-Belt. Superior A41 replacement V-Belt. 1/2” Wide, 43” Length. Durkee Atwood-Campbell Hausfeld BT-16 (BT16).